The patio at the Summercamp Hotel in Oak Bluffs on Martha&apos;s Vineyard, Ma. OAK BLUFFS — I didn’t intend to spend the afternoon collecting opinions like a wannabe pollster as I sat on the expansive porch of Summercamp, but that’s what happened as a parade of outspoken vacationers walked in and out of the lobby of the freshly rehabbed hotel on Martha’s Vineyard. Since 1879, the imposing 95-room hotel has been in continuous operation, most recently as Wesley Hotel. The Wesley was a Victorian stalwart. The kind of place where generations of New Englanders came every year and stayed among antique doodads, snoozed on beds with creaky frames, and sat in Queen Anne loveseats under period light fixtures. The Wesley changed hands last year and underwent an extensive makeover this spring to open as Summercamp. The new incarnation looks a bit like a Finish boutique hotel inspired by a Design Within Reach catalog with bits of reimagined Americana tossed in here and there. It’s bright, modern, and sports details that are a downright cheeky, such as art created with tennis racquets and arrows. On the day I rocked on the porch and looked at the harbor, former patrons of the Wesley, eager to see the makeover, walked around and peeked into the lobby. I watched bolder folks parade in and ask for room tours. As they left, the opinions flowed. According to Rachel Reider, the designer who worked on Summercamp, these looky Lous and Louises have been a regular fixture since the hotel’s makeover. A guest room at the Summercamp Hotel in Oak Bluffs on Martha's Vineyard, Ma. I stayed at Summercamp last month. I’m no authority on island history, but I’m pretty sure it’s not the worst thing that’s ever happened to Martha’s Vineyard. My room was comfortable and bright with Scandinavian flair and minimal furnishings, characteristic of midcentury design. There were USB ports built into the combination headboard/nightstands and another built-in outlet for my laptop. Off the lobby there’s a game room with a ping-pong table and board games. Nearby is a snack bar called the Canteen. I’ve stayed in more hotels than any man should in a lifetime, and the sheets here were some of the most heavenly I’ve felt. 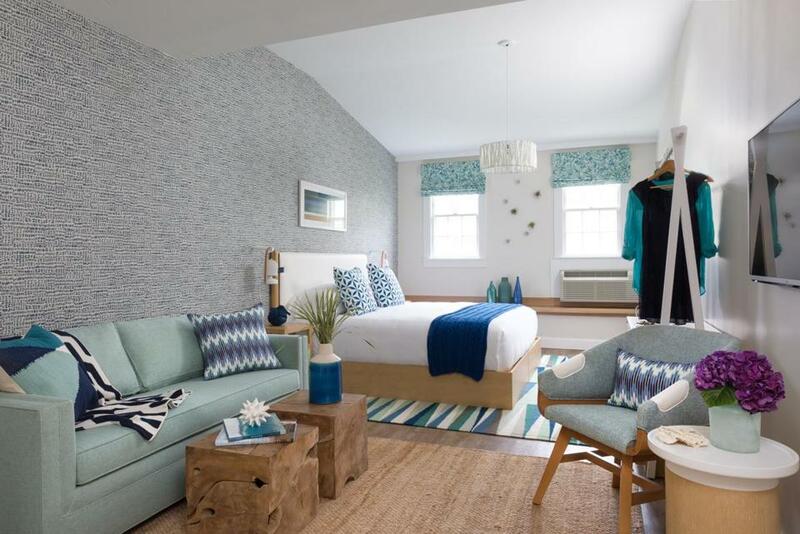 Summercamp is the latest Martha’s Vineyard property opened by Lark Hotels. Lark also has two hotels in Edgartown that debuted last year and a total of 19 boutique hotels in its portfolio. As it grows, so does the fear that too many small inns and hotels are being gobbled up and turned into digs for the design-obsessed. A guest room at the Sydney Hotel in Edgartown on Martha's Vineyard, Ma. There can be too much uniformity in heavily designed hotels. 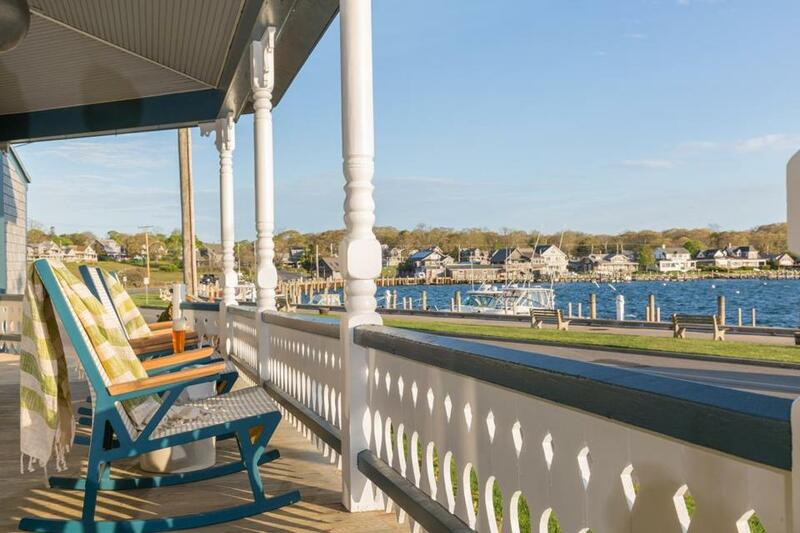 But the three Lark hotels on Martha’s Vineyard each have a distinct personality. When I stayed at the Sydney in Edgartown, I felt like I was sleeping in the attic of a well-appointed summer home. In the morning, a breakfast box was left outside my room featuring baked goods, orange juice, and piña colada oatmeal. It’s safe to say that the piña colada oatmeal was not the finest part of the Sydney experience. It was only the Christopher, the third Lark property I visited, which felt disconnected from its surroundings. The inspiration is St. Bart’s-meets-Martha’s Vineyard, but the end result of the stylistic graft was neither. Instead, let’s call it Jonathan Adler goes to the Hamptons. It’s not bad, but, as designers say, the historic exterior of the hotel was not talking to the bolder-than-life interior. I readily admit my design tastes lean more modern than old New England nautical with chintz drapes, so I wasn’t complaining. 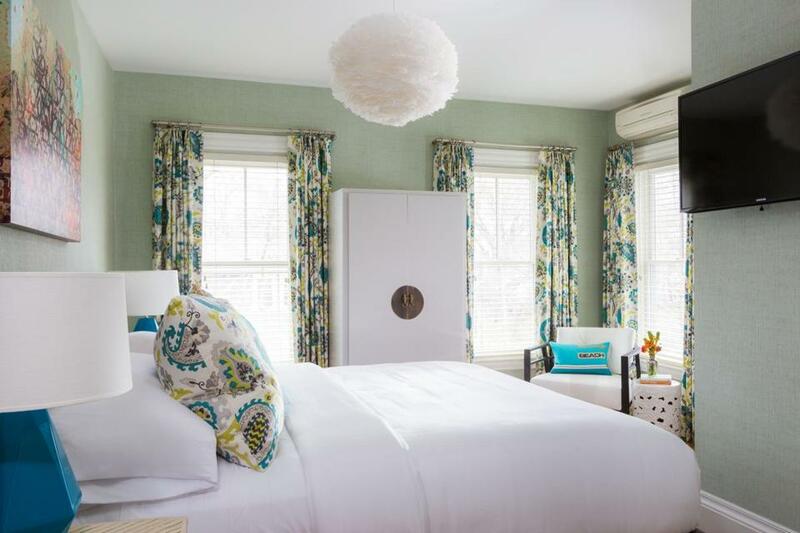 A guest room at the Christopher Hotel in Edgartown on Martha's Vineyard, Ma. Despite the Christopher’s design hiccup, I saw the arrival of the Lark properties as a positive for the island. 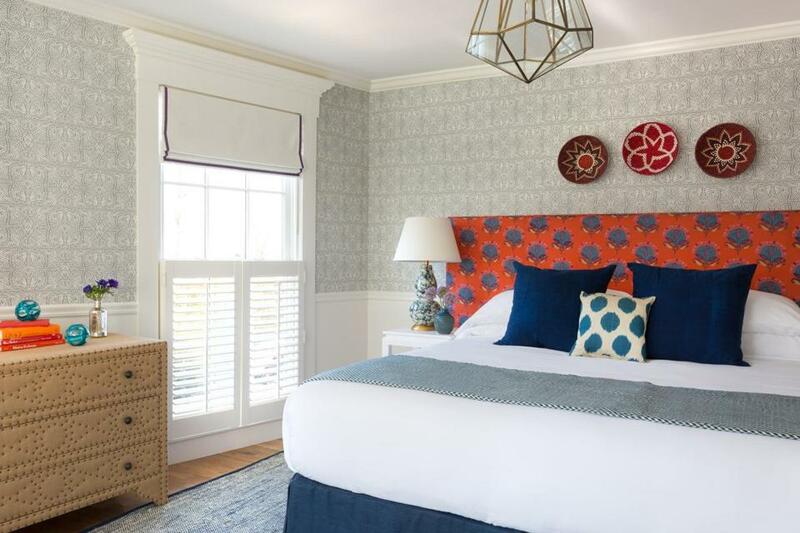 There are still more than enough traditional Martha’s Vineyard inns, and now there are more boutique hotels for people with different tastes, even those whose tastes include piña colada oatmeal. Rates at Summercamp range from $149 to $459 per night. Rates at the Sydney range from $229 to $589 per night. Rates at the Christopher range from $239 to $589 per night.